Opportunities within the sport of boxing are very few and far in between. But when a hungry, young fighter does receive the chance to showcase his talents on one of the biggest stages of the sport, he is expected to put forth his finest effort. 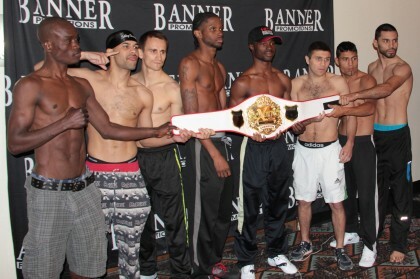 Tonight, from the Edgewater Casino in Laughlin, Nevada, eight talented Lightweight fighters will compete in the single elimination “Boxcino 2014” tournament, staged by Artie Pellulo and Banner Promotions. The quarterfinals portion of the playoff will be broadcast this evening on ESPN’s popular boxing series, “Friday Night Fights”, with a start time of 9PM EST. The highly regarded sports franchise has become somewhat of a breeding ground for future stars of boxing, and have provided much needed exposure for budding young prizefighters. In recent years, Banner Promotions has benefited from the platform and have nurtured current champions WBO Junior Middleweight title holder Demetrius Andrade and WBO Junior Welterweight titlist Ruslan Provodnikov on the widely viewed program. The president of Banner Promotions hopes that the trend will continue in 2014. All featured bouts within the quarterfinals are scheduled for six rounds. But interestingly, in the event of a draw, the respective bout will feature an additional round as a tie breaker…so the official result will be displayed as a seven round win or loss on the respective fighter’s professional resume if there is no conclusive victor after the initial six rounds are scored by the judges at ringside. But with a six round format within the Quarterfinal stage, Pellulo is expecting explosive and decisive results. 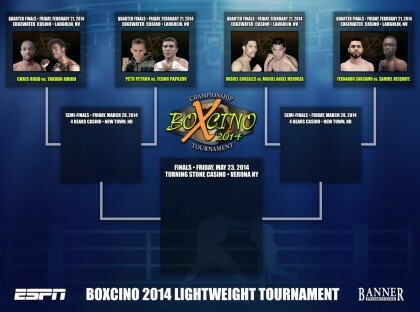 The “Lightweight Quarterfinals” of “Boxcino 2014” will begin tonight on ESPN’s “Friday Night Fights” at 9PM EST from the Edgewater Casino in Laughlin, Nevada, and the “Middleweight Quarterfinals” of the tournament will take place next Friday night at the Horseshoe Casino in Hammond, Indiana. Previous boxing news: WSB: Week 9, Group B: Cuba vs Kazakhstan!